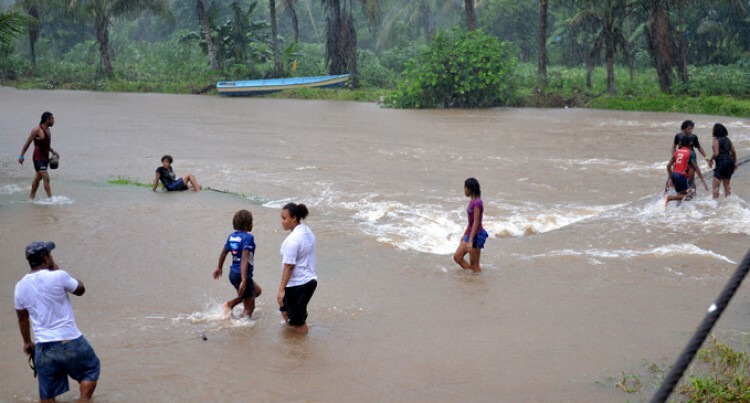 Qauia villagers wade in flood waters caused by heavy rain yesterday.Photo:Vilimoni Vaganalau. Qauia residents in Lami said yesterday they were not taking any chances. The death of a youth last year, swept away by flood waters, taught them a big lesson not to leave things to the last minute. As the Qauia River level began to rise, they started moving to the Methodist Church hall, a designated evacuation centre. Qauia, one of the settlements in Lami, is flood prone. Last year, when their settlement was flooded and people were moving to evacuation centres a youth drowned while crossing the river. Josefa Bilitaki, 63, who has been staying in the settlement for the last 15 years, said Qauia was always flooded when there was heavy rain. “Our settlement is located in a swampy area and when there is high tide, the area gets flooded,” he said. “We are always prepared but after the drowning incident, people are now even more alert. “This was an eye opener for the entire settlement and since then we are always prepared,” he said. Another resident Timoci Rokotuibau said: “We have prepared for the cyclone season in advance. “Even after the devastation by Tropical Cyclone Winston, we are more alert. “The residence of the Qauia Settlement have already prepared for this heavy rainfall,” he said. Mr Rokotuibau said they had been listening to the radio and taking precautions. People were rushing home with their emergency relief kits yesterday.